Sunsets at the marina | Outfits - Do You Speak Gossip?Do You Speak Gossip? I love taking photos near the sea, and especially at marinas, so when we were near the area the other day, I had to take outfit photos there. The combination of the marina and the setting sun in the background made these photos “magical” for me. 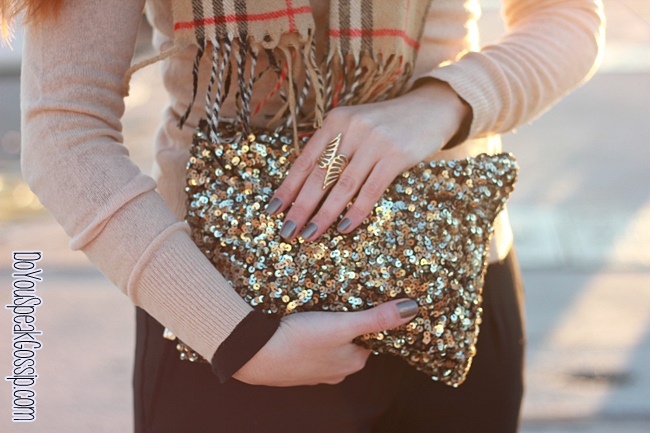 I wore a really simple outfit to attend an Avon event that my friend Elena was hosting, which I glammed up a bit with the addition of my sequined clutch. My new Betty London ankle booties were the perfect addition to this look, as I wanted to be comfortable, but still look stylish. From the day I bought them I’ve been wearing them non-stop. They are really comfortable, and perfect for my casual and relaxed outfits. I also chose to wear a plaid scarf instead of a necklace, to make the outfit more cozy and interesting. Do you like it? P.S. A big collaboration is coming on my next post. Stay tuned and for more details, follow me on Facebook. Υ.Γ. Μια μεγάλη συνεργασία έρχεται στο επόμενο ποστ. Μείνετε συντονισμένοι και για περισσότερες λεπτομέρειες, ακολουθήστε με στο Facebook. λες και δνε εισαι θεσσ ενα πραγμα! Eutixws i poli mas exei poli omorfa meri gia fwtografies…Itan eukairia! Και το outfit και ο χώρος που επέλεξες είναι τέλεια, κοριτσάκι μου!!! Amazing pictures, the sun coming down on you is such a lovely effect! Thanks for reminding me of my Burberry scarf, have no idea where it is! You look so chic and classy! Thank you Cee! I love the pictures when the sun is on the background. It creates a really interesting effect in my photos. Hey M! This is the second time in a row I’ve come to your blog for my usual catch up to find a big revalation! First your name (though as I said before, you are forever M to me!) and now your beautiful face! Well done for being brave, although you are gorgeous I can see this was a big step for you. I totally get why you did it, must be annoying always having to reach for your sunglasses whenever a camera comes out! This way you get total artistic freedom to wear your beloved sunglasses or not depending on how you feel. Hey Laura! And Happy belated Birthday! Wish I could send you my wishes on time. It was indeed a really cold month, but I’m sure it’s nowhere near as cold as in UK. I hate winter too! It takes me twice the time to get ready, because I’m always so cold, and I’m trying to find something nice and warm to wear in order to go out of the house. Thank you so much for your compliments. It was indeed a really big step for me, and it’s exactly as you described it. It was annoying having to reach for my sunglasses whenever a camera came out, and it does give me the freedom to wear them or not depending on how I feel. I couldn’t have said it better. You caught my thoughts exactly! You’re soon going to see me in a few more posts without them, since the collaboration I was talking about is coming, and I’m super excited about it. Thank you so much for everything. Always so nice reading your comments and catching up with you. αλλα μου αρεσε πολυ το ολο συνολο γιατι επελεξες κλασικα κομματια αρμονικα συνδυασμενα με το τσαντάκι να κάνει τη διαφορα, πολύ ευφάνταστο! αμα ξερεις να τα συνδυαζεις ομως!